Search Results for "Timelapse Notre Dame De Paris"
PARIS, FRANCE - AUGUST 12 2018: Timelapse of western face Notre Dame de Paris pan shot shot from left to right at sunset. Crowds of tourists near gothic cathdreal Notre Dame de Paris. PARIS, FRANCE - AUGUST 12 2018: Timelapse of western face Notre Dame de Paris tilt up shop at sunset. Crowds of tourists near gothic cathdreal Notre Dame de Paris. FRANCE, PARIS - SEP 11, 2014 (Time lapse): People on square near Notre-Dame Cathedral (AKA Cathedral Notre Dame de Paris). People on square near Notre-Dame Cathedral (AKA Cathedral Notre Dame de Paris), camera rotate. Time lapse. Notre-Dame Cathedral (AKA Cathedral Notre Dame de Paris) view from the river at night. Time lapse. Seine river and bridge near Notre Dame De Paris cathedral day to night transition timelapse after sunset. People walking on it. Paris, France, Europe. Rear view of illuminated Notre Dame De Paris cathedral day to night transition timelapse after sunset. View from Tournelle bridge. Orange sky in background. Paris, France, Europe. Rear view of Notre Dame De Paris cathedral at sunset with sun in the frame timelapse. View from Tournelle bridge. Orange sky in background. Paris, France, Europe. PARIS, FRANCE - JUNE 19, 2018: Front facade of cathedral of Notre Dame de Paris, with square full of people in front timelapse hyperlapse. Seine river and bridge near Notre Dame De Paris cathedral day to night transition timelapse after sunset. View from Tournelle bridge. Orange sky in background. Paris, France, Europe. Establishing shot. 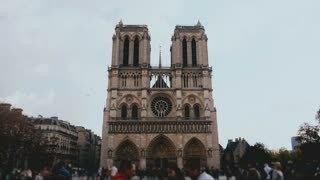 France, Paris, cathedral Notre Dame de Paris, time-lapse.